This sectional sofa features a sophisticated, unique half-circle shape that really stands out as a focal point of a room. Created by combining two modular love seats together, this sectional provides room for everyone to gather and relax together in an elegant setting. Comfort is key on this stylish sectional - pillow tops seats and double layered back cushions offer that lovely sink-in relaxing feel. 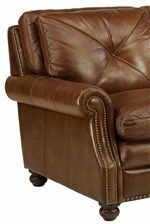 Nailhead trim adorns rolled arm panels, the back frame and front panels, above the turned wooden legs. Customize this sectional by choosing from a variety of fine leathers to upholster and match the style of your home. The Latitudes-Suffolk Round Sectional Sofa with Nailhead Trim by Flexsteel at Jordan's Home Furnishings in the New Minas, Halifax, and Canning, Nova Scotia area. Product availability may vary. Contact us for the most current availability on this product.